The three processes involved in manual cigar making include “stripping,” or preparing the leaves to be made into cigars, “making,” and “packing.” All of these steps require highly-developed fine motor skills, something once thought to be possessed more by women than men. Women were also paid much less for their work, creating a higher profit margins for cigar factory owners. The American Cigar Factory in Greenville was one of five such factories in the South owned by the company. One of the largest brick buildings in the area when it was completed, the masonry structure remains one of Greenville’s most imposing buildings. The cigar factory closed during the Great Depression, and the building was briefly occupied by the Maxon Shirt Corporation before the Stone Manufacturing Company, a clothing company started by Spartanburg native Eugene E. Stone, III, moved into the space. Stone Manufacturing quickly became one of the most successful businesses in the history of Greenville, establishing plants and warehouses throughout the area. The company, which primarily made men’s underwear, eventually used the former cigar building for warehouse space before acquiring Umbro athletic clothing in 1981 and turning the building into the company’s offices. The business eventually vacated this building altogether, and in 1999 Stone Manufacturing sold Umbro and returned to making undergarments for men. This building was uninhabited by 1994, but in 1998 it was purchased and restored as office and restaurant space by an investor. (Stone Manufacturing Company) The American Cigar Factory was one of the largest brick buildings in Greenville when it was constructed ca. 1902 by the American Improvement Company. This building was one of five factories the American Cigar Company located in the South. Situated in the heart of the central business district, it employed 150 girls and young women when it began production. The four-story, rectangular brick building features doors and windows with segmental arch openings. Each of the segmental arched window openings contains two double-hung sash windows that are divided by mullions and have six-over-nine lights. The low-pitched gable roof has a projecting eave supported by large tie beams and sleepers. The floors are supported by wooden posts. 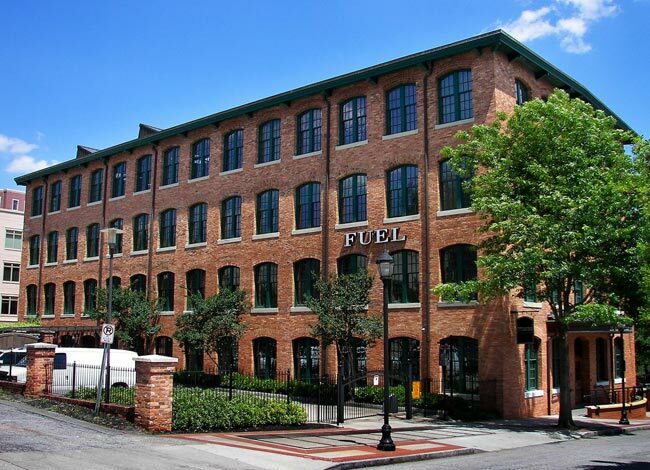 It is one of the largest brick masonry buildings remaining in the downtown area and reflects the industrial growth of Greenville at the turn of the century. What a fascinating family connection! According to an article in The Greenville News dated November 26, 1930, the factory was setting up a relief fund for workers who had been let go. So the factory looks to have closed around this time which was during the Great Depression. As for employee records we have not been able to track down detailed listings just yet. We will still be looking to see what we can come across for you. Two of my aunts worked at the cigar factory in Greenville until it closed and they were both transferred to the factory in Charleston. What year was the factory in Greenville closed? They started in 1927 and worked there until their transfers. I would like to know how long they worked in the Charleston factory.